Hoxha's campaign destroyed life and property, but could not kill the spirit. The government eased its official policy of religious persecution in the late 1980s and finally lifted the ban on faith observances in December 1990. Today, Albania's religious roots are being watered again. The Muslim majority (about seventy percent of the population) is rebuilding its institutions, as are the Orthodox Christian and Roman Catholic minorities. In 1991, into this milieu of despair and destruction, came Anastasios, the newly appointed Archbishop of Tirana and all Albania. Anastasios, a former dean of theology at the University of Athens and an expert on world religions, set to work heroically rebuilding the Orthodox Church. According to one count, 1,608 Orthodox churches and monasteries were destroyed during the communist persecution. In Albania, Anastasios turned the Marxist program upside down; he focused not on the state, but the person. "The secret of substantive change, the guarantee of change, and the dynamic through which change occurs all lie hidden within the process of restoring and purifying the human person," he says. Anastasios' ecumenical vision for social change, seen through the lens of Orthodox theology, has been admirably captured in a new collection of essays from St. Vladimir's Seminary Press titled Facing the World: Orthodox Christian Essays on Global Concerns. The essays, published during a period of 30 years, touch on topics such as human rights, Islam, globalization, and Church and culture. The book serves as an excellent introduction to the Orthodox mindset, and its interpretation of divine life and worldly affairs through scripture, holy tradition, and a trusty reliance on Greek patristics. Anastasios' understanding of social and political events is, of course, characteristically rooted in the miracle of Easter. 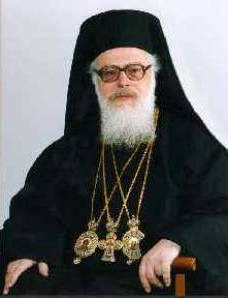 While not denying that it was the cross that reconciled humanity with God, Anastasios points out that in Orthodox Christianity the "emphasis on the Resurrection is the crucial element in the Christian ethos of the east; it pervades every thought and action, intensifies faith in miracles, and deepens the certainty that every impasse in human life will ultimately be overcome." And what better place to hope for miracles than in Albania? In the essay "Orthodoxy and Human Rights," Anastasios takes a critical view of the Universal Declaration of Human Rights, adopted by the United Nations in 1948, and the later development of these declarations into exhaustive lists of economic, social, and political rights. Anastasios makes an important distinction between rights declarations, and their enforcement through legal and political forms of coercion, and Christianity's preferred method of persuasion and faith. "Declarations basically stress outward compliance," he says, "while the gospel insists on inner acceptance, on spiritual rebirth, and on transformation." Anastasios reminds us of Christianity's contribution to the development of political liberty. "Human rights documents," he says, "presuppose the Christian legacy, which is not only a system of thought and a worldview that took shape through the contributions of the Christian and Greek spirit, but also a tradition of self-criticism and repentance." Those words should be hung from banners everywhere new constitutions and declarations are being drafted. Anastasios rightly discerns the secularizing motive and thrust behind much of what passes for human rights activism these days. He points out that a predominant ideology behind these declarations advances the "simplistic" view that people are radically autonomous beings, capable of advancing on their own innate abilities. This strict reliance on logic, the "deification of rationality," is but a short step to the logical denial of faith in a living God. Anastasios asks: Are human rights simply and merely an outcome of human rationality, or are they innate to the human personality? "Rights declarations are incapable of inducing anyone of implementing their declarations voluntarily," he concludes. "The hypocritical manner in which the question of human rights has been handled internationally is the most cynical irony of our century." Anastasios' solution to the problem of human rights is thoroughly Orthodox: "The power and means for promoting worldwide equality and brotherhood lie not in waging crusades but in freely accepting the cross." He urges a radically personal solution, one that takes as its model the saint, the martyr, and the ascetic. Here Anastasios draws on the traditional Orthodox understanding of freedom, which is ordered and tempered by ascetical practice, self-control, and placing limits on material desires. Churches are to become "laboratories of selfless love," places where the Kingdom of God is manifest on earth. "Our most important right is our right to realize our deepest nature and become ‘children of God' through grace," he says. Lest this approach be interpreted as a justification of passiveness and quietism, Anastasios also urges Christians to exercise their ethical conscience in the world. "Christians must be vigilant, striving to make the legal and political structure of their society ever more comprehensive through constant reform and reassessment," he says. In his essay on "Culture and Gospel," Anastasios reminds us of Christianity's emphasis on the "immeasurable importance of the human person and personal freedom." At the same time, he rightly warns of an interpretation of life that sees everything from a material, economic perspective. This tension between personal freedom and a distrust of the exclusively economic view carries over into his essay on "Globalization and Religious Experience." Here, unfortunately, he falls into an interpretation of economics and trade as functions of, as he puts it, "several hundreds of multinational corporations with power over the worldwide production and distribution of goods and information." He claims that the disparities between the "privileged" and the "deprived" are growing wider everywhere and cites one writer who claims that "only 20 percent of the population derives any benefit from free commerce." Anastasios' distrust of economic globalization puts him at odds with the experience of Orthodox cultures - indeed back to the Byzantine era - which were always energetic traders. Indeed, one the biggest factors in the globalization of trade in the twentieth century was the remarkable growth of Greek merchant shipping on a global scale. Still, it is not wealth itself that Anastasios condemns, but what he perceives as powerful and rapacious economic powers that hoard it and consume it. In this, his outlook is entirely consistent with the views of wealth and poverty formulated by the Greek fathers. In "The Dynamic of Universal and Continuous Change," Anastasios cites numerous Patristic sources to show that wealth is best understood in the context of stewardship. "If you exceed what is reasonable in wealth, you fall short to the same degree in love," said Basil the Great. And St. John Chrysostom: "Failing to give the poor some of what we possess is the same as robbing them and depriving them of life; for the things we are withholding belong to them, not to us." Greed is the culprit. And that is a vice even the poor can succumb to. "Many of the poor, who lack material wealth, happen nevertheless to have extremely greedy intentions," Chrysostom said. "The fact that they are poor does not save them, for they are condemned by their intentions." Anastasios' cure for the ills of secular human rights movement-a personal dedication to living out the Gospel-is really the only cure for the world's economic evils or for that matter any other social ill. The root problem is selfishness, that pervasive evil. Such a solution may seem naïve or simplistic to the secular minded. And even the religious would not go so far as to put the lawful regulation of society on the honor system. Yet, outside of coercion and control, what else has ever worked? "We have a duty to live out conscientiously the mystery of our faith - at the heart of which lies the rediscovery of the one, universal and divine koinonia - so that we can offer, without seeking anything in return or any worldly reward, the kind of genuine love that reveals the life of the Trinitarian God."